I should probably tell you that I'm usually one to wait for December to listen to Christmas music. This year, however, I couldn't resist and I'm writing this while listening to a playlist with Frank Sinatra, Michael Bublé, and Sting. It is, as they say, beginning to look a lot like Christmas, and I'm very okay with that. But before I can fully jump into the spirit of Christmas, I have to look back on the month of thankfulness. With that said, here is a snapshot of my month of November. 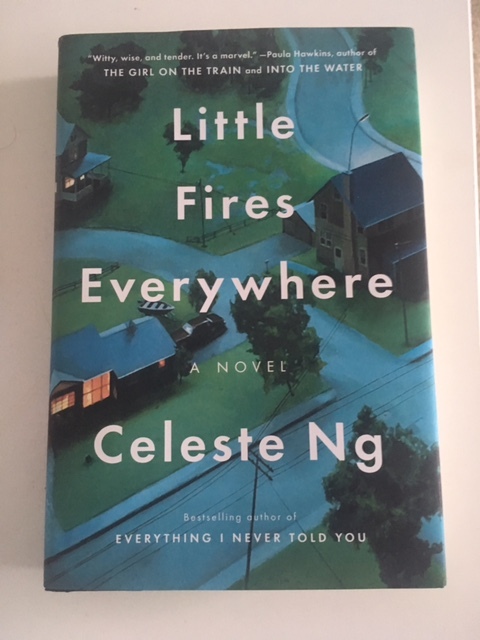 When I was sixteen, I read Everything I Never Told You and fell in love with the way Celeste Ng creates her story, the world surrounding her story, and the people who live in it. My cousin had recommended it to me, and when Little Fires Everywhere came out, she told me about it as well. It was in the back of my mind for a while, until a few weeks ago when I was visiting my dad. We were wondering through a Barnes & Noble, and I saw this sitting on it's own little shelf. I went searching for another copy and when I got home, I began reading right away. Like her first novel, Little Fires Everywhere is filled with descriptions of the city, life, and people that make up the story. Although there are many books where descriptions get tiring and all you want is dialogue, Celeste Ng has the uncanny ability to make the descriptions feel like dialogue in the form of thoughts. This book is beautiful, relatable, and has certainly earned itself a place on my shelf of favorites. Thanksgiving Break is wonderful for many reasons. Not only do I get the chance to spend extra time with family, but my friends come home from college. One of my best friends and I went to Labou on a foggy Tuesday morning, and it was absolutely lovely. I hadn't seen her since September, and even though we talk on the phone all the time, that's definitely not the same as seeing each other in person. Aside from seeing her, I had to best croissant and chai latte, and it was the cherry on top of a wonderful morning. This month was one of those months that simultaneously flew by and went on forever. I did a lot of writing, and running, and buying Christmas presents for people I love, but I also took time to sit and be still. School and work gets hectic. I get tired and life seems overwhelming to the point of me ending up in my academic advisor's office crying because I don't know what I'm doing anymore. But then there are the moments after a run, or when I finish a line of a poem I'd been working on for over a week, or when I find the perfect gift of my mom. Those moments are what makes it all worth it for me, and those are the moments I'm thankful for right now. I hope you all had a lovely November, and that December is just as, if not more so, wonderful.